“Dr. 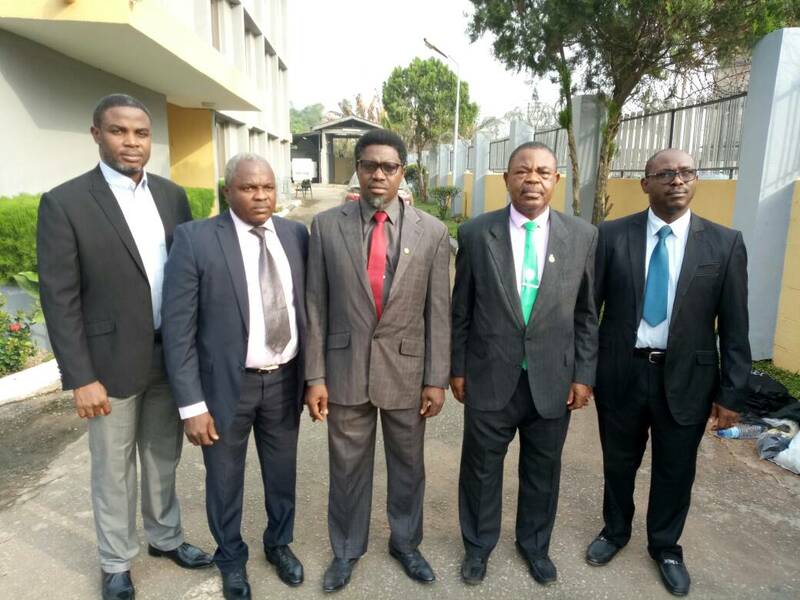 Emmanuel Ighodaro, Dr. Anthony Owolabi, Dr. Quincy Atoghengbe , Dr.Raymond Ogieva and Dr. Osaremen Gabriel Ogbebor, while acting in your capacities as officers of Nigeria Medical Association, Edo State Branch between 2013 and 2014 at Benin in Edo State within the jurisdiction of this court conspired to omit UBA Account No. 1010712142, a material particular in the Audit Report for the year, 1st August, 2013 – 31st July, 2014 of the Association and thereby committed an offence. Soon after taking their plea, counsel to four of the defendants, I. E. Imadegbelo, a Senior Advocate of Nigeria, SAN, told the court that he had a pending application for bail for the defendants and pleaded with the court to grant them bail. He noted the defendants were granted administrative bail by the EFCC and that they have adhered to the terms of the bail. Counsel to the prosecution, Ben Ubi, did not opposed the motion but prayed the court to fix a date for trial. Justice Ikponwonba granted each of the defendants bail in the sum of N1million and a surety in like sum. The surety must be a responsible Nigerian and must provide evidence of tax payment. The case was adjourned to February 20, 2018 for the commencement of trial. He is also seeking an order of the court stopping disbursement of loan and reinbursement funds to Ekiti State Government from the Federal Government and its agencies pending the determination of the matter. The defendants in the writ of summons filed in suit number FHC/ABK/CS/6/2018 on January 18, 2018 by Isaac Obrutu Esq on behalf of Kolawole and set for hearing on Friday February 23, 2018, before the Federal High Court siting in Abeokuta, Ogun State, are Mr. Dipo Abolude, Permanent Secretary, Federal Ministry of Finance, Attorney General of the Federation, Permanent Secretary, Ministry of Works; Accountant General of the Federation, Director General, Debts Management Office; and Governor of Central Bank of Nigeria. 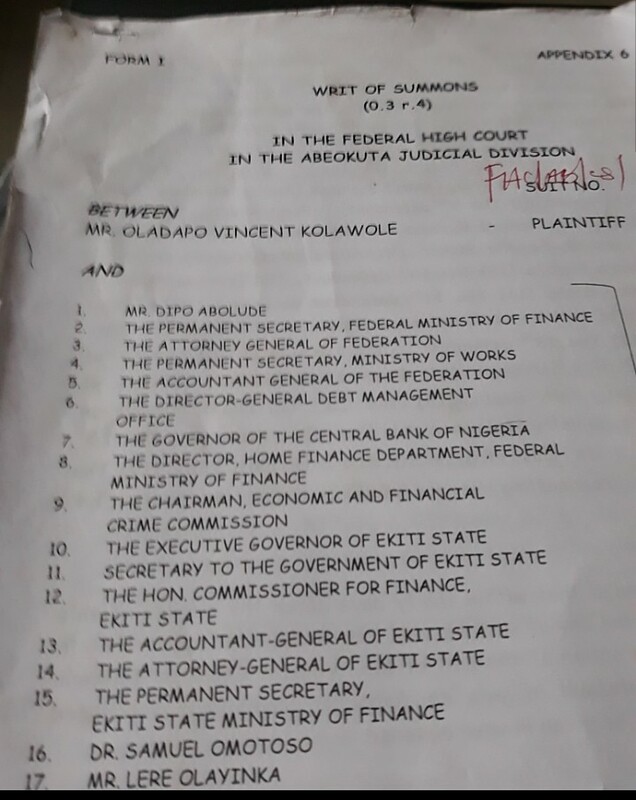 Kolawole said the first defendant, Abolude, made libelous and slanderous statements against him in Ogun State during comments on Ekiti State financial matters under investigation by the disputed probe panel investigating the administration of Fayemi in Ekiti State between 2010 and 2014. (EFCC) in Borno state; said that it has arrested two of her personnel with a girlfriend in Maiduguri. The arrested suspects, according to EFCC Zonal Head in Maiduguri, Ado Aliyu; include, Detective Assistant Habila Dungji Buba and his girlfriend, Keron Ayuba Lapips , an undergraduate of the university of Maiduguri (UNIMAID). Aliyu disclosed this on Wednesday in Maiduguri, while briefing journalists on the arrest of Bashir Muhammad, a police sergeant deployed to EFCC office over alleged theft of a case file to scuttle justice in a court of law. He said the suspects are currently at the EFCC detention facility awaiting prosecution after thorough investigation is concluded. While narrating how the suspects were arrested, Aliyu said: “On Friday, January 19, 2017, this zonal office got information from one of its suspects under investigation that someone posing as a Staff of the Commission intimated him on phone about a case under investigation involving him. The alleged imposter promised to avail him with the original casefile on condition for payment of an amount of money. He said investigation into the matter is still ongoing and more facts are expected soon. He urged the public to report any of its officer, demands for anything by any Person(s) regarding information on its cases as means of interfering with the investigation. “The fight against corruption is a collective responsibility, as everybody is a partner. Let’s join hands and fight corruption,” declared Aliyu. 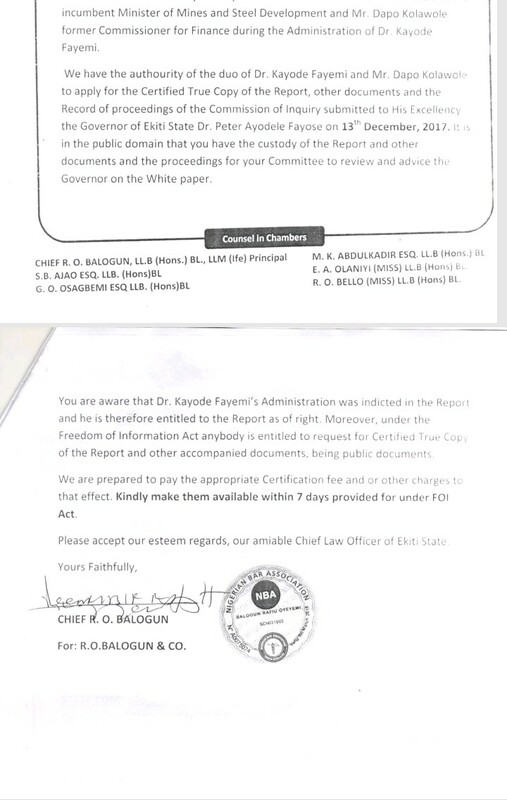 Chief Rafiu Balogun, Counsel to Dr Kayode Fayemi, Minister of Mines and Steel Development, has accused the Ekiti State Government and its top officials of deliberately frustrating efforts to obtain the report of the Ekiti State Panel that purportedly indicted the former Governor, more than a week after the document has been made public with the release of the White Paper. Balogun told journalists in Ado-Ekiti on Tuesday that he had applied for a certified copy of the report of the panel through a written application to the offices of the Ekiti State Attorney General and the Secretary to the State Government (SSG), as directed by the Secretary to the Commission. His letters to the two top officials which were dated January 11th, were received on January 12th, but according to him, there has been no response form the government, despite repeated calls to the offices. Balogun said the panel’s report is one of the important documents needed in the case being instituted by the former Governor to challenge the outcome of the panel, which barred him and a former Commissioner from holding public office for ten years among others. The legal practitioner said the government does not have any justifiable reason to block efforts by Dr Fayemi’s counsel or any citizen from accessing the panel’s report, even after it had been made public. Balogun said: “When we got the news from the print and electronic media that the Commission of Inquiry had submitted its report to Ekiti State Government on 13th December, 2017, our Clients Dr Kayode Fayemi and Hon. Dapo Kolawole briefed us to do the needful and get the Certified True Copy (CTC) of the Report from the Registry of the Commission. To that effect, we caused a letter to be written to the Secretary to the Commission Mr Gbenga Daramola, (DPP Ekiti State) but he asserted that having submitted the report to Governor the commission had concluded its assignment and wound up. He therefore directed us to the Secretary to the State Government (SSG). “We quickly wrote to the SSG on the 11th of January, 2018 and it was received on 12th January. 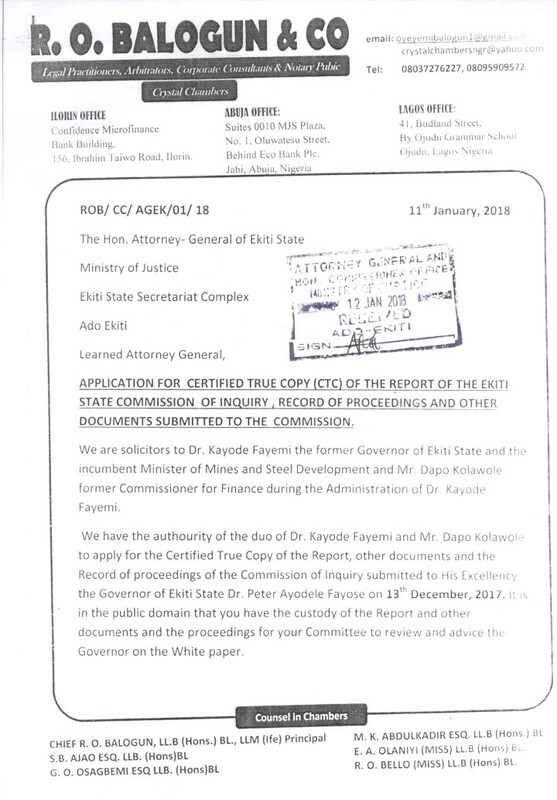 We also wrote to the Attorney General Ekiti State requesting for the report since he chairs the Committee to review the report and advise Government on the White Paper. The content of our letters to the duo is clear and unambiguous. We gave the officials seven days to make available the CTC of the Report of the Commission of Inquiry and other documents submitted by the Commission. “Our representative had at various time called at the offices of the SSG and AG to follow up but he was told that the two senior government officials were not available and that he should return the visit on Monday, January 22nd. The officials were also evasive when our representative went to request for the report on Monday. “We are not pleased with the lackadaisical attitude of the Ekiti State Government to a simple request for CTC of the Report in their custody, even when we have informed them of our readiness to pay the requisite fee for production and certification. “What does it take to produce and certify the report? It is in the public domain now that the Government has accepted the Report of the Commission of Inquiry by issuance of White Paper and requested our clients to return some money when the Commission did not find them guilty of fraud or embezzlement of any contract sum and it was not found that they have any interest in any Company that they claimed did not execute the projects. “Our Clients were also purportedly barred from holding public office for 10 years. Are they not entitled to the Report as of right? We wonder why the government is afraid of releasing the Report.” Balogun stressed. An Abuja based media firm, Image Merchants Promotion Limited and its promoter, Mallam Yushau Shuaib have slammed a N200mn suit against Access Bank Plc over an alleged unlawful freezing of their four different accounts with the bank in the past two years. The bank was dragged before a High Court of the Federal Capital Territory (FCT) Abuja by the two plaintiffs who had jointly claimed the N200M as damages for the hardships inflicted on them by the Bank with the freezing. In the suit with No. FCT/HC/CV/0657/2018 filed on their behalf by Yunus Abdulsalam, the plaintiffs are praying the Court to declare that freezing of their account by the bank as unlawful and a clear breach of the duty of care owed them by the bank. They are also praying for an order of the Court directing the bank to unfreeze their Private, Salary, Operational and Domiciliary Accounts of the Company and its Promoter with Access Bank Plc. The global award-winning media outfit and its promoter are the publishers of Economic Confidential Magazine and PRNigeria, a public relations firm. They claimed that they have tried to no avail with the bank to unfreeze their accounts which met brick walls each time and later metamorphosed to their solicitors writing the final letter to the bank. In the suit, Shuaib says that the inexplicable freezing of his account has kept him struggling to meet up with his responsibilities as the breadwinner of his family thereby putting his four children, wife and aged parents into a state of avoidable hardship. Also due to the inexplicable freezing of the accounts, the company claims that its businesses have suffered the following catastrophic developments: Over 20 employees and volunteers in the payroll resigned their employment because of the inability of the company to access its salary account for the purpose of paying monthly salary; The company has also lost patronage as it can no longer advise clients to pay into the operational accounts knowing fully well no withdrawal could be made to execute the job of its clients. In addition, the media outfit says that the freezing of its Domiciliary Account prevented its financial obligations to foreign partners, subscriptions to products, services and professional membership fees. It also added that for the first time since inception, the company’s monthly print edition of the Economic Confidential Magazine could not see the light of the day. Their solicitors had written a letter dated 21st December 2017 and addressed to the Branch Manager, Access Bank Plc, Plot 1244, Samuel Ladoke Akintola Boulevard, Garki 2, Abuja, and received same day, the bank was informed that failure to unfreeze their accounts within seven days will resort to court action as there has been no official explanation by the bank. The plaintiffs further claimed that since “the absence of their clients from the public service, Mallam Yushau Shuaib has been the alter ego of Image Merchants Promotions Ltd- the publisher of the widely read Economic Confidential Magazine and whose subsidiary is a leading and multi-international award-winning PR firm, PRNigeria. They claimed that from the record of accounts in question, it was clear that the firm has been carrying out legitimate business of PR consultancy with a vast clientele base especially from the security and financial sectors of the Nigerian economy. Plaintiffs claimed that they asked for an explanation from their mutual account officer as to the lawful justification upon which their accounts were frozen by the bank and that the response was rather evasive, opaque and vague. Therefore, the Plaintiffs applied for an order of the Court in directing the defendant to unfreeze the four accounts and also sought for an order of the Court in awarding the sum of N200m only being general and exemplary damages against the bank for unlawful freezing of their account and breach of duty of care owed to them by the bank. In addition, the plaintiffs demanded another sum of N1M against the bank being the cost of the suit. They also sought payment of 10% of the judgment sum from the date of delivery of judgment until the entire sum is liquidated. No date has yet been fixed for the hearing. An FCT High Court Maitama on Tuesday reserved ruling oin a no- case- submission filed by Dr Fortune Feberesima, former President Goodluck Jonathan’s Chief Physician. The EFCC accused Fiberesima of abusing his position as the chief physician to the president in 2012, and awarded contracts valued at N258.9 million and N36.9 million, respectively to a company where he has interests. He was arraigned on a six- count charge, bordering on abuse of office. Justice Peter Affen reserved ruling to a date that would be communicated to the counsel in the matter after they adopted their addresses on the no- case- submission. At the last sitting Mr Granville Alibo (SAN), Fiberesima’s counsel informed the court of their intention to make a no- case submission. At the resumed sitting on Tuesday, Alibo in his submission said that there is no degree of proof that the defendant was a public or civil servant where the provision of extant laws and rules apply. “ The case of the prosecution is placed on supposition and speculations “this man worked with Jonathan `, why he is walking free “he said. He urged the court to uphold the no case submission and enter judgment in favour of the defendant. Responding, the prosecuting counsel, Mr. Mukhatar Ahmed urged the court to set aside the no- case- submission and rule in favour of the prosecution for the defence to enter his defence. “ From the totality of evidence, it is our humble belief that a prima facie case has been established against the defendant. EFCC alleged the offences were contrary and punishable under Section 19 of the Corrupt Practices and Other Related Offences Act, 2000. The contracts were reclamation of land at the State House Medical Centre for N358.9 million and supply of medical consumables at N36.9 million. He was granted bail on April 25 on the same condition as EFCC administrative bail of two directors in government service with landed property in Abuja. In addition, he was to deposit his international passport with the court’s registrar. A five-man panel of the Supreme Court on Friday, January 12, 2018 ordered the re-trial of a former Speaker of the Lagos State House of Assembly, Adeyemi Ikuforiji, who was charged with an alleged N338m fraud. The apex court had reserved judgment till today to determine whether or not Ikuforiji should be tried afresh, as ordered by the Court of Appeal. The panel headed by Justice Mary Peter-Odili unanimously ruled that the case be re-assigned to another judge of the Federal High Court instead of Justice Ibrahim Buba, who had earlier absolved Ikuforiji of the charge. Justice Buba had, in a ruling in September 2014, held that the Economic and Financial Crimes Commission, EFCC, failed to establish a prima facie case against Ikuforiji and his former aide, Oyebode Atoyebi. The judge had also dismissed the 56-count charge preferred against the accused by the EFCC. Dissatisfied with Justice Buba’s ruling, the EFCC appealed to the Court of Appeal, which upturned the ruling. The appellate court had also ordered both Ikuforiji and Atoyebi to be tried by another judge. However, in 2016, both Ikuforiji and Atoyebi, with whom he was charged, tried and absolved of the charge by Justice Buba had approached the apex court, where they filed separate appeals against the decision of the Court of Appeal.